Grizzly Bears are magnificent and the biggest reason visitors choose our lodge! Grizzly bears thrive here and the viewing opportunities are spectacular. We have operated our Grizzly Bear Lodge for decades and know the prime spots for bear watching. The ultimate grizzly bear photo opportunities. 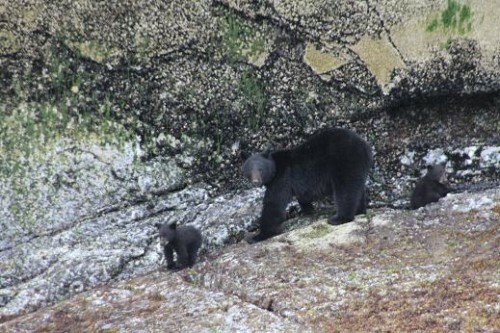 Early June, so less than six months old and we find two black bear cubs while on the trip up Knight Inlet to view grizzly bears. 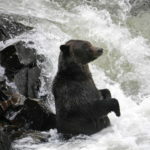 Although we go on a specialized black bear trip on your first evening in the lodge we frequently see black bears while on the grizzly bear and whales watching tours as well as the trip to Trapper Rick’s. Bald eagles are only achieve their white headed between three and five years and prior to that they are able to sit in trees unnoticed. 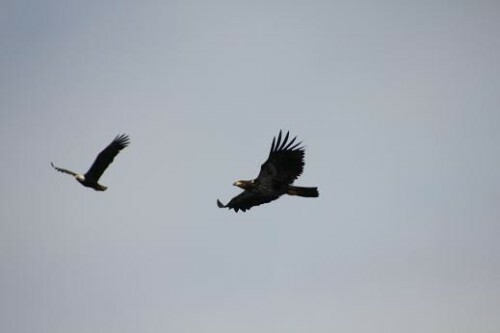 When soaring high an immature eagle is a little more noticeable. Still majestic with their wing span but something is missing. Grizzly bears mate in the spring and their babies are born from January to March so it can live in its den for about four months during the coldest weather. 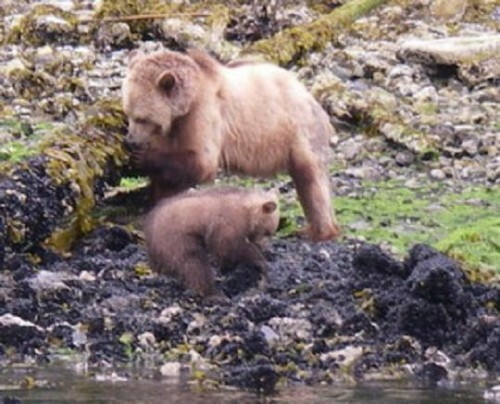 The grizzly bear cubs of Knight Inlet first appear on the shore with their mothers in late May. This meas the cubs are three to four months old and will remain with their mothers or two or three years. Although still nursing this cub copies mother and will start on solid food. 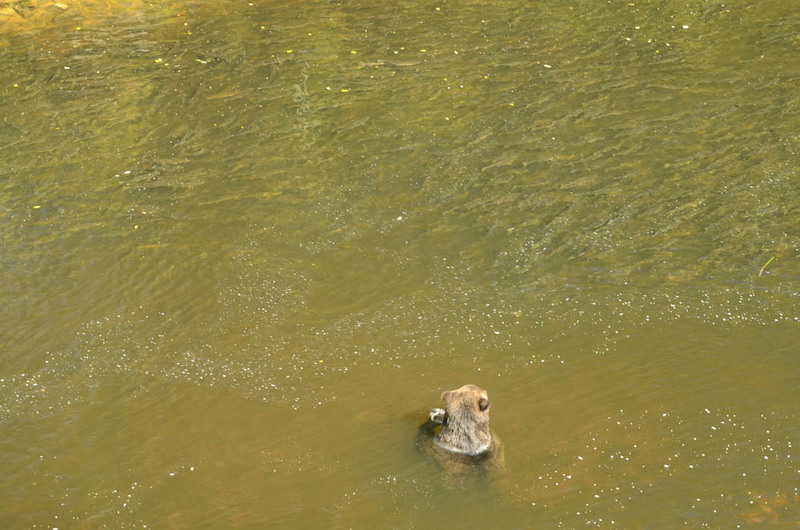 This is a grizzly bear sitting in a pool in the Glendale river in Knight Inlet. The fish that you see are returning Pink Salmon. On a good return the river is black with fish. 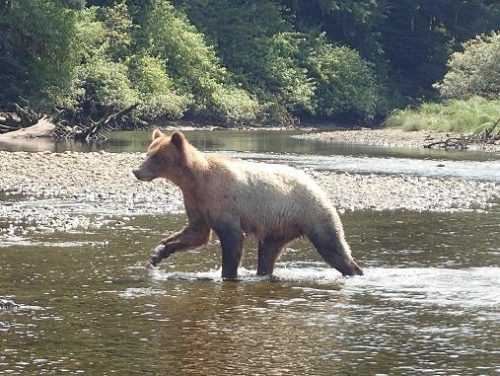 This is important, because our coastal Grizzly Bears rely on the protein rich salmon to put on enough wait to make it through their winter hibernation. .. went back to fishing and ignored us completely. It never ceases to amaze me how the grizzlies of the Glendale River have accepted our presence and as long as we remain stationary we become part of the background and are not a threat. That does not mean that the pepper spray was not ready to be used. I talked to the guests and the said that they did not feel threatened and that the bear seem calm and deliberate in it’s actions. I remember this day well. 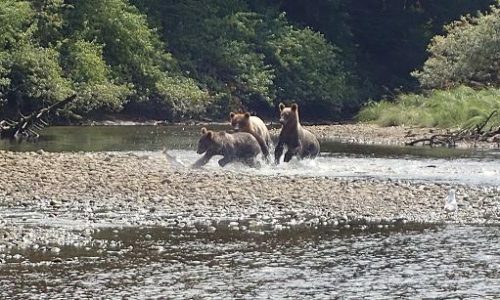 Prior to August 25 all grizzly bear watching is in the Glendale River estuary. It was a slow day with no bears and I was pulling the skiff up river in low water. 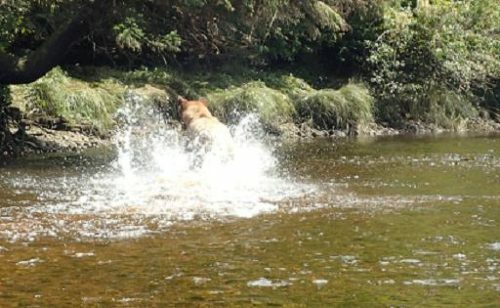 If one waits for the water to rise with the tide it is much easier but then the water is too deep for the grizzlies to trying and catch the salmon as they try to move up over the shallow gravel bars. We had just reached an area below a gravel bar when these grizzlies appeared…. 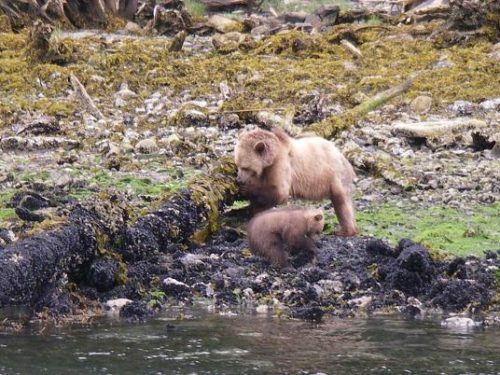 July and a mother grizzly bear and her cub of the year are on the beach working on a meal of mussels. The mother on scrapping them off a log while the cub was more into turning over rocks. The mother persisted on the log and was eventually join by her cub. Note: the mothers back upper leg has not regrown the fur that was rubbed off during hibernation. Merry Christmas from the lodge. Hope everyone has a great day and that the bears are enjoying their winters nap. Welcome to the wilderness adventure destination of your dreams! Please use the form below to learn more or book your trip now. I want to learn more! I'm ready to book a reservation! I consent to submitting the above information. 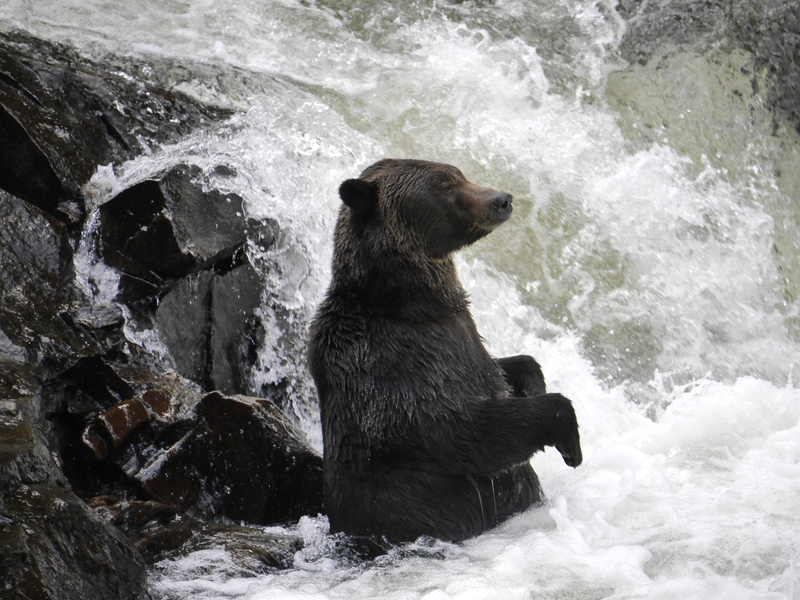 The coastal grizzly bears rely on salmon to put on the pounds required for hibernation. 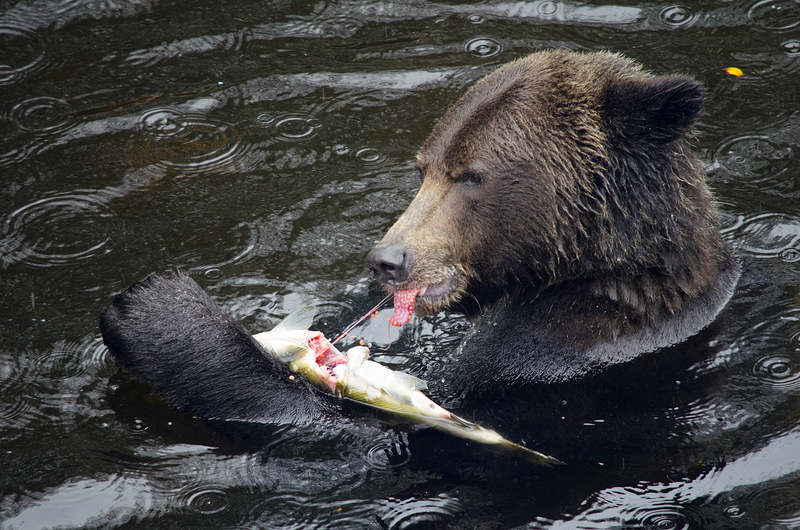 In the height on salmon season a adult Grizzly Bear can consume over 20,000 calories per day. Early in the season the bears are not particular and will eat whatever they can catch or steal. As the season progresses, however some of the better fed bears will become particular and selectively eat the best bits. The roe (salmon eggs) are the most nutrient rich portion of the fish. 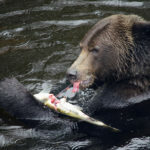 This bear is extracting the eggs and leaving the rest of the fish for hungrier bears or birds to finish up at a later time. Our tours provide the most amazing experiences and exceptional photo opportunities! We’ll bring you right to the wildlife hot spots so you can capture all the action. Whether you’re photographing the grizzly and black bears or waiting for that elusive shot of a whale breaching, our priority is to amaze you. 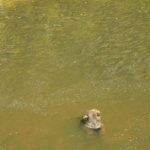 For guests interested in viewing seat otters in their natural habitat, we recommend Sea Otter Eco Tours.